The 2011 3M National Teaching Fellows want you to know that Canadian teachers care about teaching. 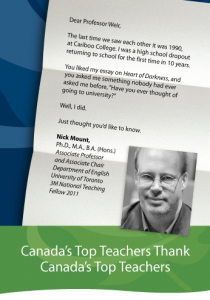 So they’re saying thanks in the Globe and Mail to the teachers who changed their lives. You can join them. Write a letter to the teacher who changed your life, in 100 words or less. We’ll post your letter on our bulletin board for everyone to see. Anyone can do it. After all, we are all students. To be part of this initiative, just complete the form below.